Providing you the best range of Luxury Coaches, Chandigarh Sightseeing, Himachal Tours, Luxury Coaches Rental, Bus Service In Chandigarh and Toyota Innova Car Rental Service with effective & timely delivery. A Bus for every occasion. Fully Air-conditioned coaches for the luxury traveller. Luxury coaches are meant for long drives with an exceptionally smooth ride and environment rich with amenities. Vehicles to undertake rugged mountain trips. Long trips or short ones. Hill stations or other picnic spots, We have the right range for you. We assure top quality services to all our customers. Whether it’s about quality drive, luxury coaches. We makes you feel at ease, wherever you go, by providing luxury Buses and excellent service. Rock Garden is a unique attraction as Chandigarh, in its being a magnificent gallery of artistic works made out of industrial and urban wastes. The raw materials have been molded to form lively images of animals, human beings, trees, etc. Founded by Nek Chand, a government official, in 1957, the garden preserves a special collection of artistry found nowhere else in the world. Sukhna Lake is a popular artificial lake in Chandigarh, made at the foothills of the Shivalik hills. It was created by Le Corbusier, in the year 1958. It is an ideal place for exercises like walking, jogging, strolling and even organizing picnics. The lake is rich in natural beauty and serves as the shelter for several migratory birds as well. Capitol Complex is Le Corbsier’s most spectacular work in the Chandigarh city. He had conceived the master plan of Chandigarh as analogous to the parts of the human body, in which Capitol Complex was supposed to be the heart. It consists of three architectural Government buildings, High Court, Secretariat, and Legislative Assembly. In the middle stands The Open Hand, the official emblem of the city, signifying the city’s credo of “open to be given, open to receive”. Located in the Northern part of India, Himachal Pradesh is known by different names like Home of Snow, state of hills etc. Himachal Pradesh is not just another hill state; it is a bag full of excitement, thrills, peaceful atmosphere and tranquility. This state gives return gift of fond memories to every visitor. After all, lifetime experiences are something that can be caught only once in a while. Himachal Pradesh has been a paradise for honeymooners, couples and adventure tour enthusiasts. And its impact can also be seen in the heavy influx of tourists who come from all parts of the world to explore the beauty of the hill state. The hilly state is also a paradise for pilgrimages are there are a number of shrines and pilgrimages in the state where devotees from all parts of the country come to pay homage to their gods and goddesses. In fast the mighty Himalaya is also a centre of attraction of the state. Enjoy your journey: To avoid the hassle of managing and coordinating with a string of cabs, luxury bus hire proves to be a great option. You could travel with a lot of comfort and convenience. A tireless and enjoyable journey is promised to you in these coaches. The fancy interiors would give you a classy touch. You could use these services for any purpose such as a sports trip, a trip for music shows, artists, executives and so on. These trips give your group a lot of privacy and at the same time helps; you have a great time with your group. We value your togetherness and in many cases we personalize your needs in the coaches. Management and Logistics made easier: Its always a nightmare to get to manage a huge crowd in different vehicles. People travelling in a single coach are great not to manage, but also to pamper and provide them with all comforts. There is a great luggage storage space, making it extremely convenient for travellers as they do not have to squeeze their luggage or be anxious about its safety or the worries of it being misplaced. Decide the Cost: The notion that luxury coach rental is only for the rich is false as there are many options for the coaches. 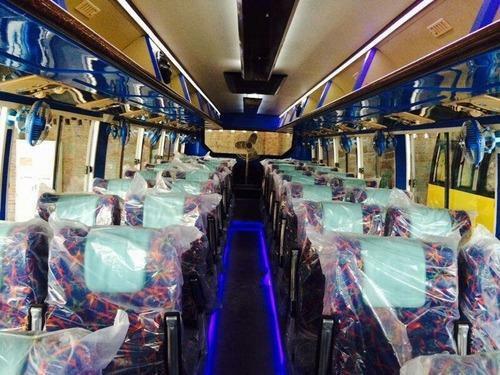 The seating capacity, the amenities and accessories differ in the various coaches. Thus, there can be many packages like economy packages, luxury packages and so on. Off-season rates may also be economic, making it very affordable for you. Whatever be the coach or the package, the fact remains that we make no compromises in the quality of the coaches and staff. Striking features of a Luxury Coach: For all those who think that a journey is the luxury coach is after all just a bus ride, we beg to differ. Relaxing journey: All possible arrangements for your comfortable and relaxing journey is taken note of. This includes provisions such as reclining chairs, reading lights, and even sleeping quarters. You may well want to compare it with a comfortable air travel!! Bathroom: The most important feature of a luxury coach is the provision of bathrooms with all the basic amenities. This is one area that people especially children and old people find very convenient instead of having to wait for the bus to stop at various places. Safety: GPS equipped roadway monitoring is fixed so that maximum safety and security is provided. It also goes without saying that all our coaches are well maintained and rechecked before each journey. The drivers come with all-important documents and with a lot of experience and knowledge of the routes. Le Corbusier planned lots of greenery in Chandigarh, by constructing a series of parks and gardens, collectively called the Leisure Valley. The valley consists of gardens extending from Sector 53 in the Southern edge to the Sector 1 in the North. Some of the gardens and parks are Rajendra Park, Bougainvillea Garden, Fitness Trails, Rose Garden, Children Traffic Park, Botanical Garden and Smriti Upavan & Topiary Park. International Dolls Museum is situated in Bal Bhawan, in Sector 23 of Chandigarh. It contains more than 300 dolls from nearly every country in the world. It was inaugurated on 24th December, 1985. The museum was established by Chandigarh administration, in alliance with Rotary Club of Chandigarh, for the purpose of entertaining the children. It is a must-visit if you’re visiting the city with your kids. Government Museum & Art Gallery is located in Sector 10 of Chandigarh and has a fine collection of stone sculptures belonging to the Gandhara School of Art. It also displays fossils and artifacts belonging to the prehistoric times and works of modern art and miniature paintings. This square building (165 feet by 165 feet) is a splendid display of architecture by none another than Le Corbusier himself. Chandi Mandir is a temple located in the northern border of the city. Devoted to the Mother Goddess of power, Chandi, it is considered as one of the twelve Shakti Peethas for Hindus. The name Chandigarh is derived from this shrine only. There is an aura surrounded to this temple and if you are in search of divinity and tranquility, there is no better place for you than this temple. It is also one of the oldest temples of the area, claimed by many to date back to era of Mahabharata. Toyota Innova AC Toyota Innova is a popular multi utility vehicle conducive to entire world conditions. This six seater vehicle offers excellent ride, world class comfort and super performance making your travel pleasant and enjoyable one. Tempo Traveller 12 AC Clear Car Rentals offers Tempo Traveler 12 seater for picnics, weddings, and also for all kinds of tour packages. Tempo Traveler is a sturdy vehicle meant for group travels and transportation. Mahindra Xylo AC Clear Car Rental- an online car rental company offers Mahindra Xylo on hire for your any travel plan in India. Mahindra Xylo is a MUV car manufactured by Mahindra & Mahindra. Sit behind the wheels of masculine Tata Safari and feel the thrill of exhilarating power to leave strong presence on road. Reclaim your life with fresh and revamped Tata Safari which is here to rule the Sports Utility Vehicle segment with the stunning looks, awesome features and power of new age engine with state-of-the-art technology. This car Tata Sumo accommodate 9 persons easily. offers you with a variety of Car Packages tours in India. By hiring Toyota Qualis Taxi for the particular Indian destination you can avail great discount for your exciting holidays. Ford Fiesta: Ford Fiesta AC Ford Fiesta is a mid-sized sedan manufactured by Ford Motor Company. The car comes with several variants which shares many common features among themselves. The car is known for its great comfort and appealing design. The modern air conditioning system of this 4+1 seater car offer pleasant and enjoyable ride to its occupants. Tata Indigo: Tata Motors company of India has launched Tata Indigo as a large car in India. Tata Indigo is a premium, luxury and multi purpose vehicle. Tata Indigo car is produced in India. This car is offered by us with air conditioning as well as without air conditioning. The seating capacity of this car is of 5 persons including driver with comfortable and spacious seats. You can rent this car for traveling anywhere in India by Indo Vacations. Toyota Innova: Toyota Innova AC Toyota Innova is a popular multi utility vehicle conducive to entire world conditions. This six seater vehicle offers excellent ride, world class comfort and super performance making your travel pleasant and enjoyable one. It comes with world class safety feature, versatile space and modern styling. Toyota Innova has state of the art safety features like global outstanding assessment (GOA) body, large disc brakes, SRS airbags, side door impact beams, high rigidity frame, and collapsible steering column which offer passengers a safe and smooth travel. Ford Fiesta AC Ford Fiesta is a mid-sized sedan manufactured by Ford Motor Company. The car comes with several variants which shares many common features among themselves. The car is known for its great comfort and appealing design. The modern air conditioning system of this 4+1 seater car offer pleasant and enjoyable ride to its occupants. Toyota Innova AC Toyota Innova is a popular multi utility vehicle conducive to entire world conditions. This six seater vehicle offers excellent ride, world class comfort and super performance making your travel pleasant and enjoyable one. It comes with world class safety feature, versatile space and modern styling. Toyota Innova has state of the art safety features like global outstanding assessment (GOA) body, large disc brakes, SRS airbags, side door impact beams, high rigidity frame, and collapsible steering column which offer passengers a safe and smooth travel. We are a top notch supplier of 12 Seater Tempo Traveller Rental.